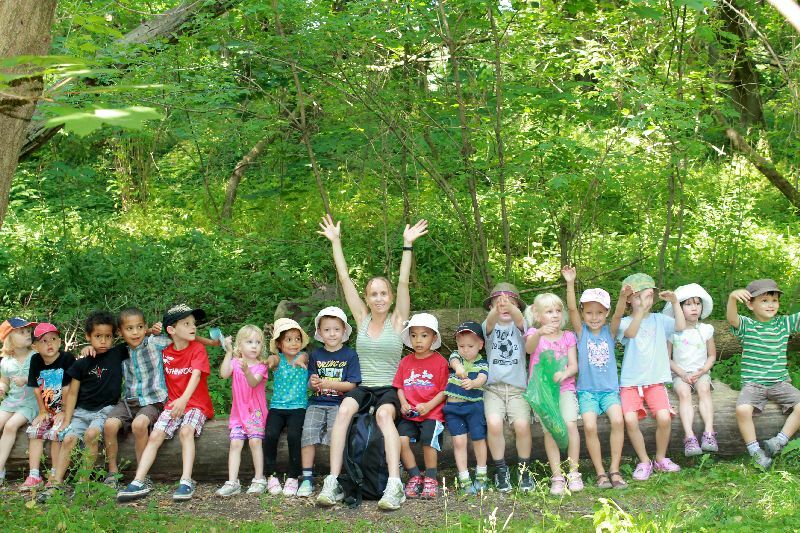 At our Summer Program we offer a variety of activities such as creative arts, music, gardening, cognitive games, science and discovery projects and lots of outdoor and indoor play. We have a nature garden, where your child can prune the apple trees, tend the strawberry patch, water the plants in the butterfly garden and play in the sandbox. Your child will receive French lessons, yoga and music every day. We have a gym, which is ideal for those days when the weather is unsuitable. The children can enjoy our full range of gym equipment, such as balance beams, tumble mats, balls, ropes, hula hoops, etc. We also organize team sports in the gym, such as basketball and soccer. There are walking field trips to Exhibition park, City Hall wading pool, Guelph Public Library, Goldie Mill Park and Guelph Civic Museum. We incorporate academics into our program activities in a relaxed, child friendly manner. Our staff are trained Montessori teachers and early childhood educators with many years of experience. Our Summer Program is very popular and fills up quickly so contact us soon. PLEASE NOTE: Children must be reliably toilet trained in order to attend our Summer Program. The following is an overview of some of the activities planned for MSW’s Summer Program 2019. More detailed weekly calendars will be sent out closer to the end of the school year. We kick off the first week of camp with some summer fun. This will include many outdoor activities such as camping games and songs, water play, painting a watercolour mural and sports day at Exhibition Park. Week two is all about taking care of our planet starting with caring for the environment around us and having fun doing it. Children will be exploring the life cycle of plants using our five senses. Each child will be planting their own seeds, caring for the seed and observing how the seed germinates. The next stage of our observation will be exploring the different living things in our environment through a nature scavenger hunt. This week we will travel around the world. Children will have the chance to experience new cultures, foods and games indigenous to countries around the globe. Children will be making and tasting different cultural foods. As we explore the different cultures we will also be playing the games that children living in different parts of the world play. This week we will have a special musical storyteller from the GOGO Grandmothers of Guelph who will share with us stories and songs from various African cultures. Giving us the opportunity to see and play different musical instruments from this part of the world. During week four we explore the wonders of the animal kingdom! Children will discover the needs and characteristics of some of their favorite species along with the growth and changes in their habitats. As a part of our animal kingdom exploration, children will also become classroom archeologists and learn about animals that existed before humans. July 29 – Aug 2/19 (WEEK 5) INTO SPACE! Blast off into space with us as we explore the names and attributes of each of the planets. Take in a touch of astrology as we recount some of the stories of the constellations, all while learning their names. To further explore the stars in our night sky the children will build their own telescopes. They will discover how rockets fly and create model rocket ships. For our last week, we come down from outer space and head deep within our waters to discover life under the sea. Children will dive into discovering more about some of their favorite underwater creatures, what they look like, what they eat and how they live underwater. They will also create clay canvas artwork of their favorite underwater creatures.